It’s hard to imagine a flourishing vegetable garden without carrots. They’re actually pretty easy to grow from seed – so long as you take account of a few golden rules. In this video and article we’ll walk through the entire process for growing them – from sowing to lifting – so you can be confident of enjoying trouble-free roots every time. In the ground, within raised beds or on the patio in tubs – carrots can be grown just about anywhere. They prefer full sun and well-dug, stone-free soil. Beds improved with well-rotted compost are ideal, though very recently manured beds may cause roots to fork. For best results, follow carrots on from a heavy-feeding vegetable such as cabbage. There are many different types of carrot to choose from. Stump-rooted and finger-sized carrots are quickest and may be grown in small pots, or in heavier soils that would cause longer roots to fork. Medium or long-rooted carrots can be grown in lighter soils or in raised beds or deep containers filled with potting soil. Maincrop types are perfect for sowing later in spring to produce roots for winter storage. Carrots don’t just come in orange! Try one of the many colorful alternatives, including purple, yellow, white and red roots. Sow carrots from early spring to midsummer to be lifted from late spring to early winter. Stored roots will tide you over until the following spring. Make the earliest sowings of fast-growing early varieties into greenhouse or hoop house beds, or pots kept under cover. You can also sow earlier outside by using row covers or cold frames. Our Garden Planner can help you to work out exactly when to start sowing. Simply select and drop in a row or block of carrots, then click the accompanying Plant List for sow and harvest dates based on your location. Adding crop protection – for instance a row cover – will adjust sow and harvest dates accordingly. Click back to the Plant List, where you'll see that the dates are now a half-month sooner than the carrots without protection. For a continuous supply of carrots, you’ll need to sow a row every two to three weeks, with the final sowing made in midsummer using a maincrop variety. Carrots do not like being transplanted, so it’s best to sow them directly where they are to grow. Remove all stones from the soil – if a carrot root hits a stone it will fork - then rake the soil to a fine tilth. Now mark out your seed rows. The seed drills should be about a quarter inch (1cm) deep, with rows spaced about six inches (15cm) apart, depending on the variety you’re sowing. Sprinkle pinches of the seeds thinly along the row then close the soil back along the row to cover the seeds. Carrot seeds are very small, so to make sowing easier you can mix the seeds with dry sand, which will help to spread the seeds out within the row. Once you’re done, label the row with the variety and date. To sow into tubs, fill containers with potting soil then gently tamp down to firm. Sow the seeds very thinly over the top, then cover with a quarter inch (1cm) layer of potting soil. Water, then label. Carrot flies or rather, their maggots, are notorious for damaging the roots. To thwart this low-flying insect cover the ground with a row cover or garden fleece immediately after sowing. Take care to secure the edges of the cover so there are no gaps. Keep covers in place throughout the life of the crop. Container-grown carrots are very easy to shield from carrot fly, by simply raising the container up off the ground. Alternatively grow companion plants such as leeks next to your carrots to confuse the flies. Our Garden Planner features a handy companion planting filter. Simply click on your carrots then select the heart-shaped Companion Planting button to show suitable companion plants in the selection bar. You can now select and drop in your companion next to your carrots. Or double-click on the carrots to bring up the varieties box then click the plus button to read variety descriptions, including those showing some resistance to carrot fly. Any clumps of seedlings can be thinned out as necessary by very carefully pulling any excess out. This can, however, dislodge the roots of neighboring seedlings, so alternatively you can use scissors to snip off the foliage instead. Do this on a still day to prevent the carrot smell alerting nearby carrot flies. Sometimes carrots can run to seed (bolt) before they’ve had a chance to form their roots. Keep the soil moist in dry weather to help avoid this, and regularly remove weeds to minimize competition for available moisture and nutrients. Carrots don’t normally need additional feeding, but occasional mulching with a light-blocking organic mulch such as compost or leafmold will help prevent the tops turning green. Lift the carrots as soon as they reach the right size. The size of the top of the root poking out of the soil is often a good guide, or gently dig away the soil from around it to get a better look. Harvest alternate carrots so those left can grow bigger. Smaller, finger-sized or stump-rooted carrots are usually easy to pull up, while chunkier maincrop types may need easing out of the ground with a fork. In places with mild winters carrots can be left in the ground to harvest as needed. Alternatively, dig up the roots, twist off the foliage then store in boxes of damp sand kept in a cool, dark place. Crunchy, vibrant and outrageously good for you – nothing compares to garden-grown carrots! I hope this has convinced you to give carrots a go, whether you’ve never grown them before or if you’ve had bad luck in the past. You can let us know how you get on in the comments section below. And, of course, don’t forget to share any clever growing tips or recipes while you’re at it. "how big does the top green part get to know when to pick carrots this is the first time I ever grew any thing so I am not sure of most of this "
"The green parts will be anything upwards of about 15cm (6in) tall. But the best way to judge whether your carrots are ready to harvest is to simply push back the soil from around the top of the root to get an idea of the size of the root below. Once you've harvested several roots you get a good eye in for judging when they are good to lift." "You make it sound so easy! I have been trying to grow carrots for years but I can’t get them to germinate. I have tried every container imaginable but after 7 years of allotments I’ve given up ??" "Hi Carol. I'm not sure why they wouldn't be germinating for you. 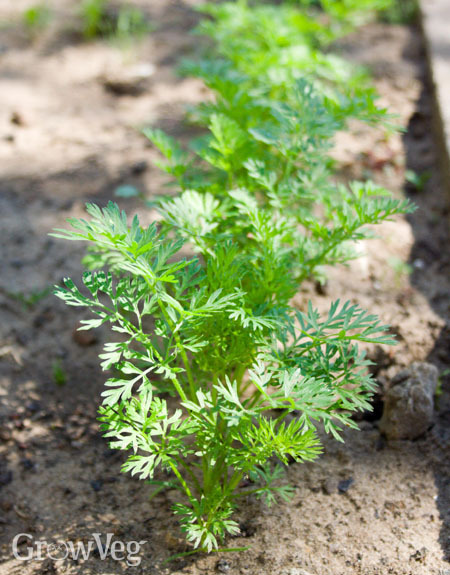 Carrots are best sown directly where they are to grow, into well-draining soil/potting soil. Keep the ground moist but not saturated to speed germination. Are you sowing at the right depth? It may also be worth buying fresh seed if you're trying to sow using seed you've kept for a few years. Keep the seeds somewhere cool and at a steady temperature." "If I dug up my carrots too soon, can I replant them? Does the answer change depend on the season and/or temperature outside?" "Carrots don't like root disturbance, so if you've dug them up and fully cleared off the soil then it is very unlikely that they will be able to be replanted to continue growing. However, if conditions are cooler and the carrots are of a good size and of a suitable variety for storing, you could cut off the foliage then place the roots in a single layer in box of sand, where they should keep for at least a month or two. Store them somewhere cool but not freezing."